Tavi Gevinson was just 11 when she appeared on the fashion scene in 2007, not via New York or Paris, but through her PC in Oak Park, Illinois. Through her insightful and whimsical blog, Style Rookie, Gevinson mused on topics ranging from couture collections to middle-school dress codes, building an online fan base of teenagers and adults who loved her then-signature gray hair and eccentric sense of style. At 13, having endeared herself to the glitterati, Gevinson was invited to New York’s Fashion Week, where she shared the front row with sartorial royalty. Eventually, Gevinson befriended celebrities like Kate and Laura Mulleavy, the designers behind Rodarte, and radio personality Ira Glass, who offered guidance as Gevinson grew into her public persona. Now at the ripe old age of 16, Gevinson is the editor-in-chief of Rookie Mag, an online venture originally planned with Jane Pratt (the founding editor of Sassy). Rookie is a fascinating new form of media, a free online magazine designed for young women and, more importantly, created by them as well. 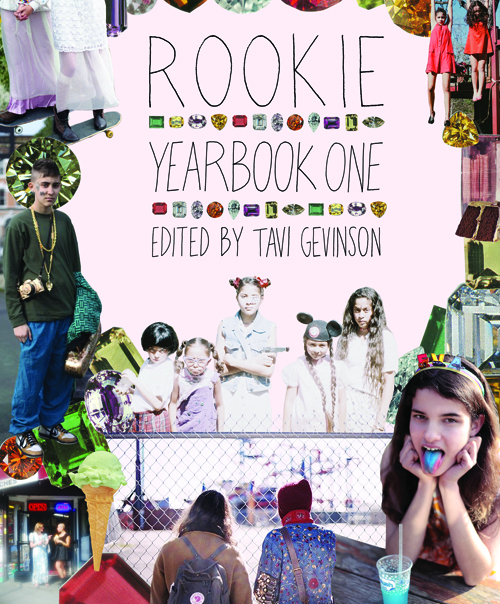 Rookie‘s young contributors give the publication an authenticity seldom seen in the world of teen media, as they tackle everything from zine-making to celebrity crushes to eating disorders, all in a confidential, no-nonsense tone. In an era when older folks often lament that young people don’t care for “real things” anymore, and objects from the past in particular, Gevinson represents a generation that enjoys a true blend of old and new: Her teenage cohorts are just as interested in the music of Joni Mitchell as that of Taylor Swift; they love shopping at vintage stores as much as American Apparel. Besides Rookie Mag’s online presence, Gevinson hopes the site will inspire regular meetups with readers and all kinds of DIY crafts. We recently spoke to Gevinson about her views on feminism, mood boards, and the magic of nostalgia. Top: Tavi makes her getaway. Photo by Petra Collins. Above: A Los Angeles-inspired mood board Tavi created includes a paperback copy of “Weetzie Bat,” Peter Max paper airplanes, a tapestry her mother made, and vintage postcards and photographs. 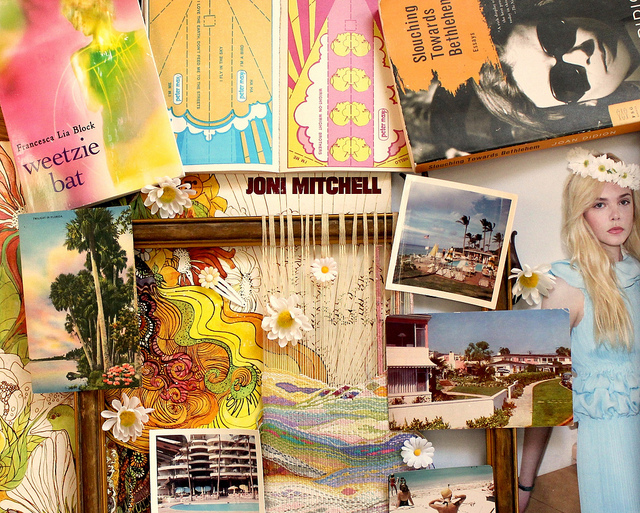 Collectors Weekly: What exactly is a mood board? Gevinson: A mood board can be tangible or something you make on a computer. It’s basically a collage of images that have some sort of underlying theme. I used to have this little brown table in my room where I had a different mood board each month, and it was an accumulation of objects from my room—books, items of clothing, jewelry, candles, rocks, or whatever—that had a similar color palette and vibe. Each month of Rookie is a different theme, aesthetically and in terms of what we write about and our pop culture heroes for that month, so I send all our contributors a different mood board each month. The November theme was invention, and there’s a lot of retro futurism, or the ideas people had of the future in the past, and then also a classically cute fall style. There are a lot of girls with umbrellas. Collectors Weekly: So what appeals to you about vintage clothing? Gevinson: To me, it’s special because of the idea that there’s a pre-existing history for that item, whether you know it or not, whether it’s been passed down to you or you find it in a thrift store. When I first became interested in fashion and started shopping at thrift stores, my friends would say, “You don’t know who wore that,” and I would be like, “Exactly.” That’s why it was exciting. When I wear some of those clothes, I do look like a crazy person, but other items people think are really well-designed. It’s probably because of Pinterest and “Mad Men,” but I don’t get as much flack anymore at school. I feel like everyone agrees that the Mid-Century ’50s and ’60s aesthetic is good design. A lot of ’70s things that I like are admittedly tacky, but everyone thinks “Mad Men” is beautiful. I live in a suburb of Chicago, and whenever I walk around, there are always a few corners that pop out because they look like a moment that’s been frozen in time. I keep a list of those places, and this summer when my friend Petra came to visit from Canada, we drove around to all of them taking photos. I was wearing mostly vintage clothing in the photoshoot, too. Seventies-inspired looks from Tavi and Petra’s neighborhood photoshoot. 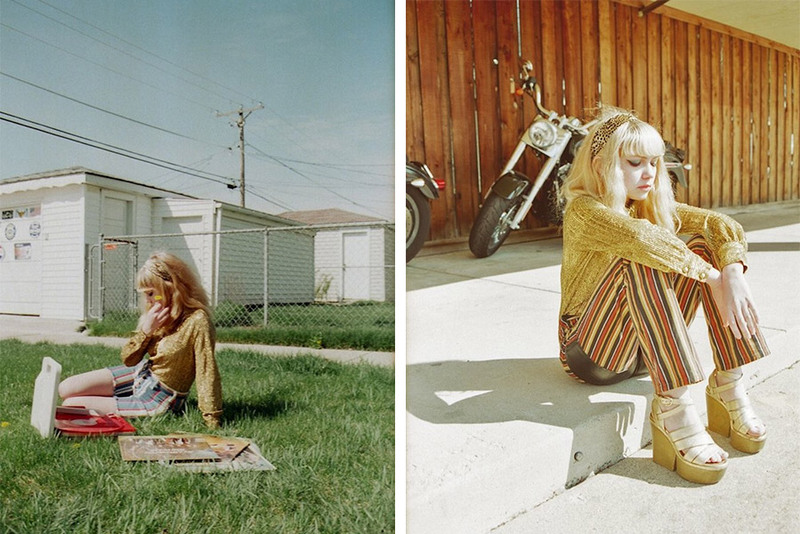 Photos by Petra Collins. Collectors Weekly: Do a lot of your friends and Rookie Mag readers like to go thrift shopping? Gevinson: Yes. Most of my friends go thrifting because it’s cheap and practical, and you can find cute things. It’s not so much of a statement anymore. Whenever we have had Rookie events, I think people get more dressed up because they know that it will be fun for everyone to be all dressed up together. 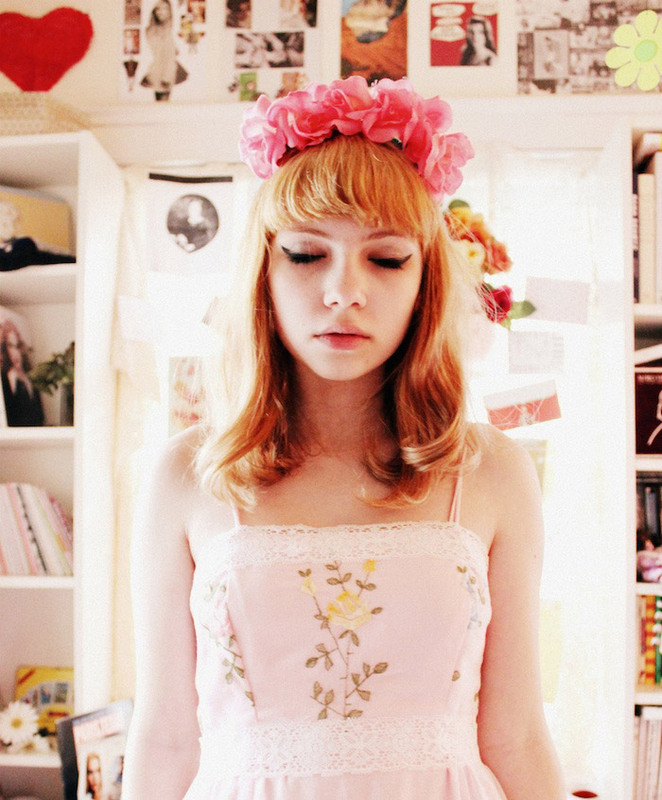 A lot of girls come in wearing really sweet-looking vintage clothing. Collectors Weekly: Your original Style Rookie blog was frequently praised because of your bizarre, atypical fashion sense. Has your style changed now that you’ve become a public figure? Gevinson: I don’t think it’s changed because I’ve become more of a public figure. Yes, my style lately is not as mismatched as it was, but my actual image is less public than it was before even as I’ve, I guess, become more successful. I was at the absolute height of my awkward phase when I went to Fashion Week. It’s supposed to be this place with the most beautiful people in the world, and I was this incredibly tiny, gray-haired—what’s the word?—gnome. That was the time in my life when I was most photographed, and I’m not embarrassed by that; I think it’s hilarious that in the middle of these rooms full of tall, skinny people in black was this tiny weird person. Collectors Weekly: In a gigantic bow. Gevinson: Yeah, with a giant bow. I think it’s awesome that it made a lot of people angry. I felt pleased with that because I spent all my time trying to prove that fashion wasn’t just frivolous and could have personal or public meaning, and here you had a bunch of people somehow making a giant bow into a metaphor for the death of fashion journalism. I thought it was great. But I think you go through phases and then grow out of them. Before, dressing up was my outlet, and now I’m pursuing other creative things that take up a lot of time and energy, so in the morning I usually want to put on something simple and comfortable. Collectors Weekly: How does Rookie challenge certain stereotypes of women or feminism? Tavi ruffled the feathers of a humorless, black-only fashion crowd at New York Fashion Week in 2010. Since we’re online, we don’t have to worry that much about ads. For the book, we used an independent publisher who really trusted us. We’re also continually working on getting a more diverse staff and figuring out what our readers would like to read and what people want to share. When I started Rookie, there were a lot of girls like me who had fashion blogs and loved getting dressed up and thinking about appearance, not in a stressful women’s magazine way, but in a creative way. I can understand how some feminists who’ve fought against things like style or beauty defining all women might feel confused about how we can discuss self-esteem and being your own person but also write so much about fashion. But for Rookie, fashion is about personal expression and creativity. And I want there to be a place where women can do that, where you can care about fashion, and even be super girly, and it doesn’t necessarily mean that you’re not also smart or confident or strong. Collectors Weekly: Are the real-world events and activities you organize important to Rookie’s mission? 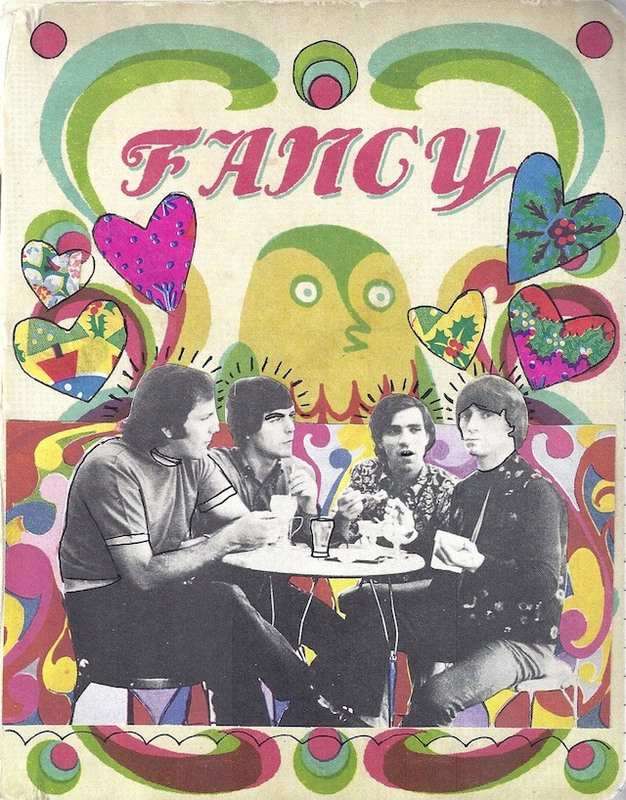 The cover of Rookie Mag’s first annual yearbook shows the handcrafted, vintage-and-new collage style the publication celebrates. Gevinson: I used to think of Rookie as only the website, and then we put out the yearbook, and now I feel like it has three components—the website, the book, and the events. When we started Rookie, my dad was like, “How are you going to run a website? You’re in school,” and I thought, “Well, everyone else will be in school, too, so we’ll just post three times a day and we’ll make sure they’re all really strong.” And I remember thinking I don’t want Rookie to post too frequently because I know our readers have real lives, and don’t want to presume they would be glued to their computer screens, waiting for our every word. I want them to go outside, and I want them to be creative. A website is a perfect medium for us because it’s accessible to so many people and it’s great for building a community. But I do think there is a lot of bitterness about what the Internet means for activities like in-person communication, going outside, listening to a record, or watching a movie (not on your phone). We want to encourage our readers to go and have those experiences for themselves as well. With the yearbook, my biggest concern was how to justify putting out an actual book and making it so strong on its own when most of its content can be read for free online. The key was to make it beautiful and to be super obsessive about the design. We put the first one out in September, and it’s a compilation of the best content from September of 2011 to May of 2012. It goes month by month, and each one has a different theme. A lot of our readers love it; they appreciate that tangibility. I think people have this idea that teenagers don’t want that, but in a way maybe the rarity makes something real, like a vinyl record, even more special and exciting. Collectors Weekly: You guys make a lot of crowns, right? 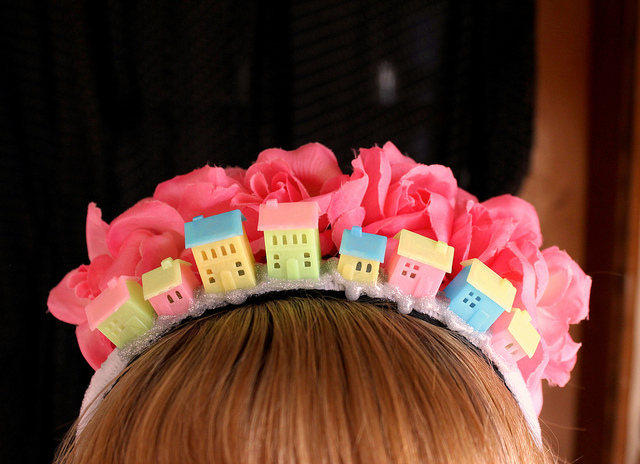 Gevinson: Yeah, I love the combination of handmade accessories with vintage clothing, and especially accessories that have some kind of pop culture thing on them. Petra made me a crown with Laura Palmer from “Twin Peaks” on it. Right now I’m in my room, and I’m looking at a little box that a Rookie reader gave me that has Leonardo DiCaprio in “Romeo + Juliet” on the inside. One of Tavi’s homemade crowns, a favorite craft of the Rookie crew. Collectors Weekly: People usually think of teen pop culture as Brat Pack films, but you appreciate shows like “Twin Peaks.” What interests you about these offbeat cultural phenomena? Gevinson: I actually like it all. I love John Hughes, and I even love a solid “American Pie” or “Scream” type movie. But with “The Virgin Suicides,” “Twin Peaks,” or “Heavenly Creatures,” those things were not made for teenagers. These are movies about teenagers that weren’t necessarily marketed to teens, which is why they’re so appealing to me and why I was so excited to discover them. In seventh grade, when I found out about “The Virgin Suicides,” it was so much more thrilling to me than more recent young-adult novels. As a young person, you want the perspective of what it will feel like when this will all be over. I think that reading so many books and watching so many movies that are about the teenage experience in retrospect have helped me put everything in perspective and appreciate all of this for what it is. The fact that a show like “Freaks and Geeks” is about teenagers for adults makes it so much more realistic and honest. They’re not trying to teach you anything, and I think that helped going into my teenage years. 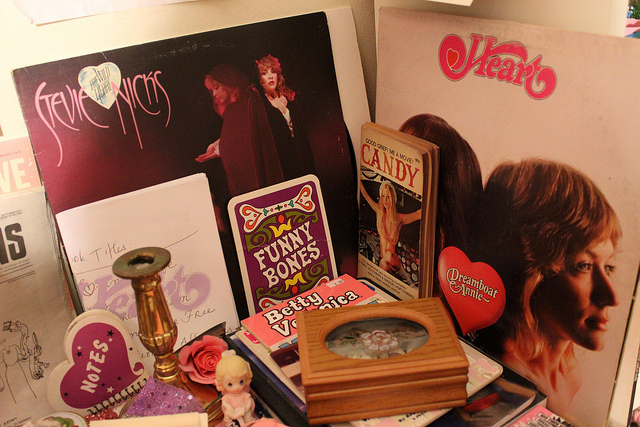 A still life from Tavi’s bedroom, showcasing her love for the 1970s. Collectors Weekly: Do adults like reading your blog? Gevinson: A lot of adults have told me they enjoy my blog because they’re discovering something for a second time through someone else’s eyes. Being a teenager is both good and bad, but one thing that’s really special about it is that you do experience a lot of things for the first time. I would even say that it’s a state of child-like wonder, but maybe even better, because when you’re little there’s no pain and no filter to your wonder. When you’re a teenager, you’re looking for something more specific, and when you find it, that feeling of excitement is so much more complex and fascinating to me because it typically includes a lot of pain. “The Perks of Being a Wallflower,” doesn’t make you feel good in an obvious way, the way something makes you feel good when you’re a little kid and it’s exciting in a very simple way. It makes you feel good because it reconciles feelings of wonder with feelings of pain. Tavi was thrilled to pore over hundreds of high-school keepsakes belonging to a Rookie contributor’s mother, including these diaries. Collectors Weekly: “Perks” is always stereotyped as this alternative teen story, but it seems to resonate with most young people. 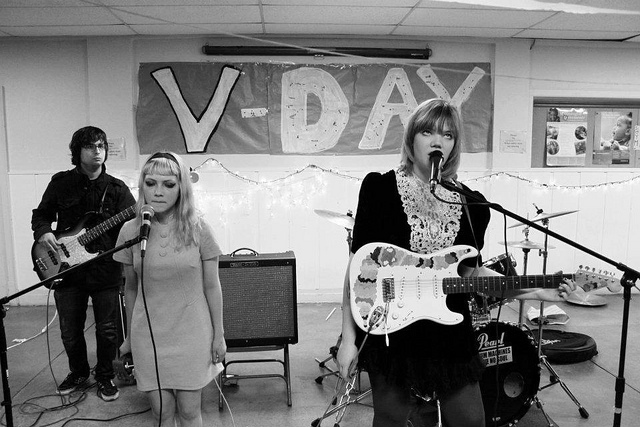 Tavi (middle) performs with friends for V-Day, an activist event to end violence against women. It’s such basic “Breakfast Club” stuff, but I don’t think that some girls are happy all the time and some girls are depressed all the time; I think there’s a part in everyone that feels insecure at times. So much pop culture is about either loving being a teenager and making it look super glamorous, or absolutely hating it. It’s either “The O.C.” or it’s “Daria.” I don’t want to do either, because I don’t think you can love or hate something all the time. With Rookie, I just want to make the best of it. A counterculture develops because people feel rejected by the mainstream culture, but wouldn’t it be great if, instead, people didn’t feel rejected to begin with? Maybe that’s impossible, but so many of the people who work on Rookie, so many people who read it, and so many of my friends at school are technically art kids, but we still love Justin Bieber. 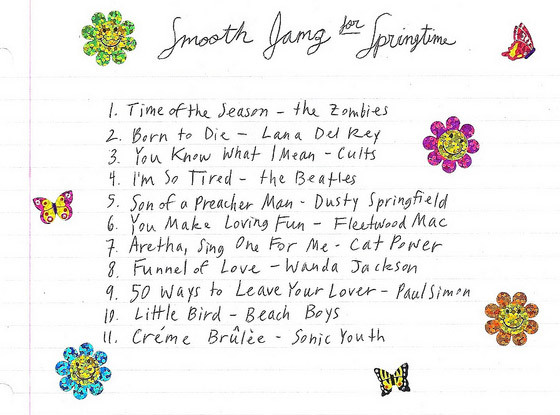 Tavi frequently posts playlists on her blog, mixing music from many eras and genres. Collectors Weekly: Totally; real people are complicated. I read your review of Wes Anderson’s “Moonrise Kingdom,” and I’m curious what you think about the fictional 1960s world he creates. Gevinson: I love “Moonrise Kingdom,” and it’s much more interesting to me than just a nostalgia trip. The movie does take place in the ’60s, but all the cutesy kids’ stuff and Boy Scout tools form this very specific aesthetic. The whole movie has this strict color palette: It’s New England and rainy and all the colors are green and blue and yellow. And then there’s this one scene—if you haven’t seen the movie, person reading this, you should skip this paragraph because I am about to give away part of the movie. There’s this one scene where it opens on a view through Suzy’s binoculars of a dove on the water, and the sky is pink and reflected in the water so that they kind of blend into each other. It’s the one moment in the movie that breaks away from this typical school color palette of yellow, blue, green, and red. It’s pink and they have flowers in their hair—it’s my favorite part. Tavi keeps track of the kitschy spots in her suburban town that look straight out of the past, like this pink and white house. Photo by Petra Collins. Collectors Weekly: Why do you think this vintage-inspired nostalgia is so appealing to people? Gevinson: Well, memory often makes things more beautiful. My mom’s from Norway, and my dad went to Woodstock, so there’s a bit of those influences in our home and in the music I listened to growing up. My mom had all these weird Scandinavian tools everywhere and I used to be obsessed with musicals. So in my mind, my childhood was like “The Sound of Music” somehow, and it was very quaint, even though I know that’s not totally true. I found this old picture recently of me as a baby, naked in a field in Norway, and I was really happy about it because I know in reality there was only a little of that. Mostly, I watched TV all the time. It used to bum me out, that nothing is as perfect as we imagine it, but now I’ve come to appreciate that as a special event on its own. I’m in my room right now facing Chris Ware’s new graphic novel, “Building Stories,” which includes a quotation from Pablo Picasso that says, “Everything you can imagine is real.” That was a weirdly empowering thought for me, because so much of my experience as a person is dreaming of what I wish everything could be. It somehow gives validity to the act of yearning for something. I’ve been obsessed with all these things about the teenage experience for years before I even was a teenager, so I had a lot of expectations about what teenage existence should be. And I think I’ve somehow found a way to consider listening to music and daydreaming as valid an experience as the real ones most of us miss out on. 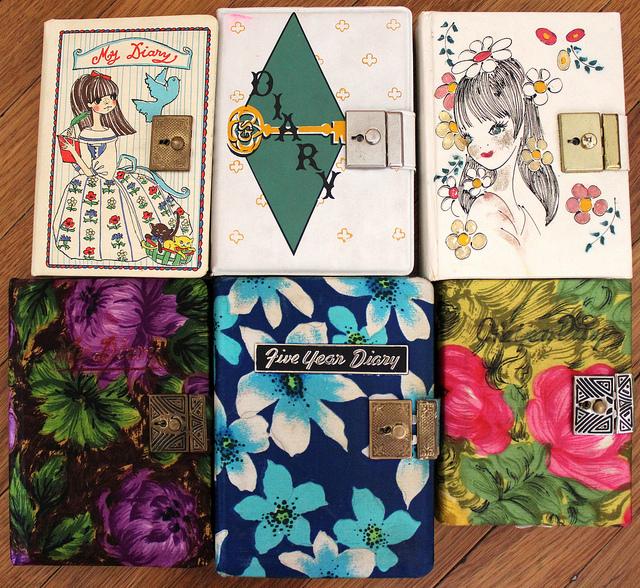 The customized cover of one of Tavi’s journals, where she also records her aesthetic inspirations. Collectors Weekly: It’s nice to think that by indulging in nostalgia we’re creating this beautiful picture that’s easier to edit because it’s in the past. You can’t edit real life that way. Gevinson: Exactly. That’s the feeling Wes Anderson adds to what would otherwise be a normal, 1960s period piece. There’s this photo in the counselor’s office at my school, probably from the ’80s or ’90s, and it’s a picture of a girl sitting on the bleachers wearing a red sweatshirt and a black leather motorcycle jacket with a little bit of snow and frost around her. Today as I was walking home, I looked up from the ground for a moment, and there was a little bit of sun coming through the clouds as I was passing the track. I could see the bleachers, and all these people playing sports and the grass and the maroon track, and then this red car went by it with frost on it, and it all reminded me of the photo of the girl. That image with all these different colors was really special, but I looked down quickly, and when I took a longer look it wasn’t special at all. I think there is something to be said for how sacred perception can be in recognizing something that is beautiful to you. In the world, there are all of these images floating around from people’s imaginations, and it’s reaffirming to think that there’s a lot more out there we can’t even see. I recently interviewed the man who started The Museum of Jurassic Technology in L.A., and I burst into tears once we hung up. He wasn’t abusive; it was completely the opposite. Basically, I was like, “Do you ever feel like there’s a shortage of wonder in the world?” And he just laughed and said, “That thought has never crossed my mind.” Then I asked him, “What do you do if you’re so jaded that you can’t appreciate it?” He paused for a very long time, and I was worried that he hated the question. Then he started talking about all these doves that were flying around him at that moment, and it was amazing. Tavi in Wonderland: A self-portrait taken in Tavi’s bedroom. Special thanks to Petra Collins for her photographs. I’m blown away with her maturity and insight. It’s so refreshing to hear these thoughts from someone so young. Tavi is one of my idols and as a teenage girl, finding her personal blog and Rookie mag have helped me accept my own personal style and who I want to be as a person, what it means to be a feminist and how to deal with all the complicated situations of teenagehood. I feel she is a brilliant role model. Tavi continues to be eloquent, thoughtful and outrageous . Can’t wait to see what 30 year old Tavi gets up to. I absolutely love this. I think about this so often, and she puts it into words beautifully. Great article. She is so ridiculously articulate and smart. Rookiemag is an amazing resource for young people and definitely fills what used to be a void. I’m 30 and still find rookie to be stimulating, helpful, and insightful. Tavi herself is just as much of a role model and female marker for my own feminist perspectives as someone older and more published. She is a gem all on her own. She is the obscure discovered album, the fleeting moment of sunlight, and landmark of cultural happening all wrapped up. And I, like others, want to allow her room to grow with anticipation of what is to come. Great article: an inspiring young woman. Unfortunately, I’m not 16 like Tavi, I’m 32. I work as a high school teacher in Switzerland. I use the site Rookie and Rookie The Year Book to help me connect with my students. The articles are excellent and really speak to young people. The students love her and the her work as do I. Well done to her. Tavi is such an amazing, intelligent person. Where I am, my life in general… I would feel so much more isolated if it weren’t for Rookie Magazine. There are no restrictions, you are supposed to be young and you are supposed to learn from it. I’ve learned a lot, met so many fantastic people (including Tavi) because of the magazine. Even though I’m not really even a teenager yet, Rookie is a place that is made for me. Teenagers in general. I’m totally gushing, but this was one of the greatest interviews I’ve read about her and when I learn more about her I love her more. I was questioning my feminism and self-esteem the day I found Rookie, and when I read through the archives, I felt just. . . So much better about myself, and reassured that the other people who thought like me were there and they were so smart. I owe a lot to Tavi and Rookie Mag. “ ” I still have my stupid life and these stupid thoughts that go through my head.